Surf News Network, 8 November, 2014: There is a 58% chance of El Niño during the Northern Hemisphere winter, which is favored to last into the Northern Hemisphere spring 2015. During October 2014, above-average sea surface temperatures (SST) increased slightly across the eastern half of the equatorial Pacific. The weekly Niño indices were between +0.6oC (Niño-3.4 and Niño-1+2) and +0.9oC (Niño-3) at the end of the month. Subsurface heat content anomalies (averaged between 180o-100oW) were largely unchanged even as a new down welling Kelvin wave increased temperatures at depth in the central Pacific. The monthly equatorial low-level winds were near average, although anomalous westerlies continued to emerge on occasion. Upper-level winds were also mostly average across the Pacific. The Southern Oscillation Index continued to be negative, accompanied by mostly average rainfall near the Date Line and suppressed rainfall over Indonesia. Overall, several features across the tropical Pacific are characteristic of borderline El Niño conditions, but collectively, the combined atmosphere and oceanic state remains ENSO-neutral. Similar to last month, most models predict El Niño to develop during October-December 2014 and to continue into early 2015. However, the ongoing lack of clear atmosphere-ocean coupling and the latest NCEP CFSv2 model forecast have reduced confidence that El Niño will fully materialize (at least five overlapping consecutive 3-month values of the Niño-3.4 index at or greater than 0.5oC). If El Niño does emerge, the forecaster consensus favors a weak event. In summary, there is a 58% chance of El Niño during the Northern Hemisphere winter, which is favored to last into the Northern Hemisphere spring 2015 (click CPC/IRI consensus forecast for the chance of each outcome). This discussion is a consolidated effort of the National Oceanic and Atmospheric Administration (NOAA), NOAA’s National Weather Service, and their funded institutions. Oceanic and atmospheric conditions are updated weekly on the Climate Prediction Center web site (El Niño/La Niña Current Conditions and Expert Discussions). Forecasts are also updated monthly in the Forecast Forumof CPC’s Climate Diagnostics Bulletin. Additional perspectives and analysis are also available in an ENSO blog. The next ENSO Diagnostics Discussion is scheduled for 6 November 2014. El Nino – and What is the Southern Oscillation Anyway?! El Nino, an abnormal warming of surface ocean waters in the eastern tropical Pacific, is one part of what’s called the Southern Oscillation. The Southern Oscillation is the see-saw pattern of reversing surface air pressure between the eastern and western tropical Pacific; when the surface pressure is high in the eastern tropical Pacific it is low in the western tropical Pacific, and vice-versa. Because the ocean warming and pressure reversals are, for the most part, simultaneous, scientists call this phenomenon the El Nino/Southern Oscillation or ENSO for short. South American fisherman have given this phenomenon the name El Nino, which is Spanish for “The Christ Child,” because it comes about the time of the celebration of the birth of the Christ Child-Christmas. To really understand the effects of an El Nino event, compare the normal conditions of the Pacific region and then see what happens during El Nino below. 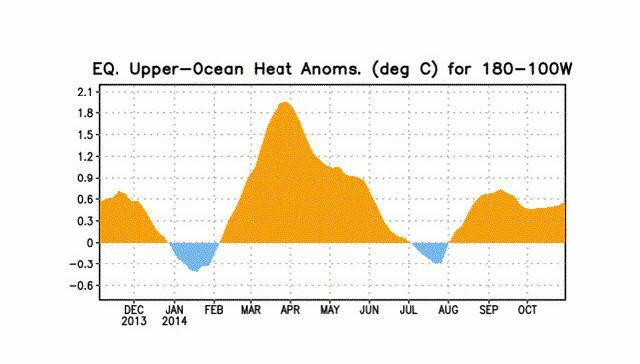 El Nino ConditionsScientists do not really understand how El Nino forms. It is believed that El Nino may have contributed to the 1993 Mississippi and 1995 California floods, drought conditions in South America, Africa and Australia. It is also believed that El Nino contributed to the lack of serious storms such as hurricanes in the North Atlantic which spared states like Florida from serious storm related damage. Unfortunately not all El Nino’s are the same nor does the atmosphere always react in the same way from one El Nino to another. This is why NASA’s Earth scientists continue to take part in international efforts to understand El Nino events. Hopefully one day scientists will be able to provide sufficient warning so that we can be better prepared to deal with the damages and changes that El Nino causes in the weather.